Is that Berlin map?Whatever it is atmosfere and background looks great as skins!Nice! Everything looks so great! Good job everybody on the team and everyone working on this. Of course, then I started hallucinating of some very nonstandard end-of-war schemes, when even the stores of Dunkelgelb were running low. There are several cases of at least Panthers leaving the factory with the lower hull painted in the red anti-corrosion primer only, with only the turret and upper superstructure being Dunkelgelb. More often though Panzergrau (of which there was still plenty left) was used as necessary instead of Dunkelgelb - at least Tiger II's and Jagdtigers were both spotted wearing gray. And then I remembered the mid-war schemes from the "transition period", when Dunkelgelb used to repaint existing vehicles, but again, being short of supply due to being new, sprayed in a random pattern over (but not completely covering) the Panzergrau (and the Olivgrün camo pattern, if applied). So the Hanomag with the red stars is an example captured by the russians? Anyway, it looks great and adds more variety! Which front/maps will the tanks with the new ambush schemes be seen on ? Yeah, as well as looking MAGNIFICENT, they maybe look a bit like they've just too recently rolled out the factory (constructive criticism, hopefully). I guess there would be mud splashes, grass and bits of undergrowth showing from being in combat. Shell hit decals ? The new scemes are all on East Front maps so far. Tbh I think FHs vehicles are some of the dirtiest I've seen of any mod. Liking the late war StuG IV... one question though, do they come with a Rundumsfeuer MG 34? No, only late war StuG 40 ausf. G has Rundumsfeuer MG 34 in game. Shame ... so no chance to see this in game ? I wouldnt go as far and say no chance. It all depends wether someone wants to modify the existing vehicle to have that MG-setup on it and if theres demand by it from a mapper who'd place it in a map. Can we get new sreenshots ?? 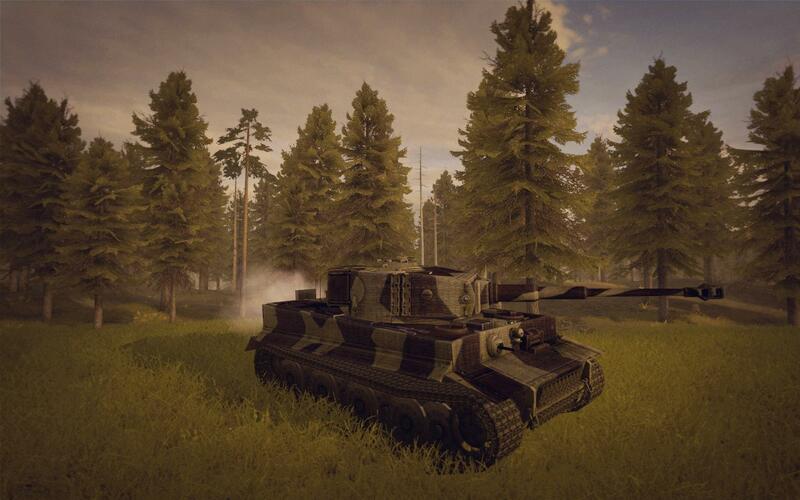 I hope the Tiger I textures will be updated as well ⇾ more subdued / diffuse. Fairly unusual, somewhat hard-edged cam on that Tiger.